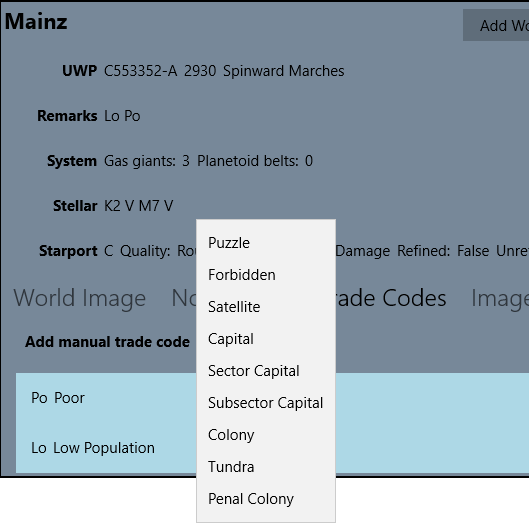 Now you can add non-UWP trade codes (Hot, Puzzle, etc) to the worlds. Next I need to actually do the T5 trade stuff - there was just a lot of work to get the infrastructure in place (wanting to make this user-customizable as possible so you can run it with whatever rules you want). Where(x => x.Sizes.Length == 0 || x.Sizes.Contains(Size)). Where(x => x.Atmospheres.Length == 0 || x.Atmospheres.Contains(Atmosphere)). Where(x => x.Hydro.Length == 0 || x.Hydro.Contains(Hydro)). Where(x => x.Pop.Length == 0 || x.Pop.Contains(Population)). Where(x => x.Gov.Length == 0 || x.Gov.Contains(Gov)). Where(x =>x.Law.Length == 0 || x.Law.Contains(Law)).